It's a real Root Beer Fest for the rest of the week. This morning, I took ten of the kegs that I filled yesterday to our wholesaler in Council Bluffs. 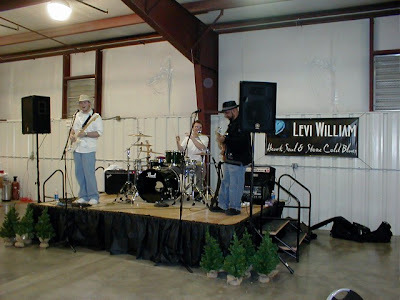 They, along with our Norfolk wholesaler, were bought out by an Omaha company recently. With luck, I'll get to drive to Omaha instead of Council Bluffs from now on; our straight truck isn't licensed in Iowa, so I've been having to take the van. I got back to Columbus around 2:30 and started filling kegs for the Norfolk delivery: 20 half-barrels and 40 five-gallon kegs. I got the half-barrels filled along with 14 of the smaller cans, draining one seven-barrel tank and part of another one in the process. I dropped another seven barrels of root beer from upstairs into the empty tank; it should be carbonated by tomorrow, so I can fill the other 26 five-gallon kegs. With luck, I'll be able to make the delivery tomorrow, but more likely it'll be Friday. There are 137 tri-clamp fittings in this picture. Can you find them all? That took most of the day, and I was looking forward to a relaxing beer before going home. But a phone call from our wholesaler in Council Bluffs asking for sixteen half-barrels of root beer was shortly followed by an order from our wholesaler in Norfolk asking for 40 five-gallon kegs and 20 half-barrels of root beer, all of which needs to be delivered by Friday. I don't have that much root beer in the cellar, but I do have fourteen barrels ready to go, and another 28 standing by, uncarbonated, upstairs. So here's the plan: fill as many half-barrels as possible from one of the tanks in the cellar, then transfer seven barrels into that tank from upstairs and carbonate it tonight. Then I should be able to fill the rest of the kegs tomorrow. I got twelve half-barrels plus one quarter-barrel out of the root beer tank. I can take ten to Council Bluffs tomorrow, then come back and fill up the ones for Norfolk for delivery on Thursday. And I did have time for that relaxing beer that I thought I was going to get earlier. I'll have to rewrite my schedule for the next few days when I get home. Normally, this would be Line Cleaning Day, but I'm going to be doing some maintenance on the draft lines this week. To that end, I made a quick trip to Ace Hardware to order 300 feet of tubing that I'll use to replace the old CO2 and beer jumpers from the kegs to the wall brackets. That will happen on Friday, so I'll clean the lines at the same time. Today's big project is to disassemble, clean, and rebuild the twelve keg couplers in the cellar. Tedious, sticky work, but it's probably the first time they've been properly cleaned in ten years, plus most of the O-rings needed replacing. I didn't expect the job to take four and a half hours. I'm going to add "keg coupler cleaning" to my regular line cleaning routine from now on. The batch of All-American Gold that I brewed on Friday took off like a volcano, and blew foam and yeast all over the fermenter room floor, so that all got hosed down after lunch. The gravity has dropped from 11.0°P to 3.5°P — corresponding to about 4.1% abv — and it's still going strong. I may end up diluting it a wee bit when I filter it. Or maybe not. Tomorrow, I'll start replacing the 300+ tri-clamp gaskets. That should keep me busy for a couple of days, at least. 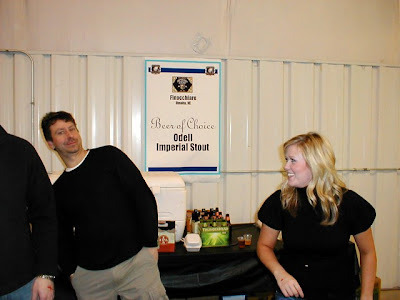 We're taking beer to the 6th Annual Winterfest Ales & Auction in Lincoln tonight. It's a fundraising event for Matt Talbot Kitchen & Outreach, hosted by the Advertising Federation of Lincoln. I'm told they're expecting 700 people tonight, 100 more than last year. We loaded up the kegs at 3:00 and started the 1½-hour drive to Lincoln. 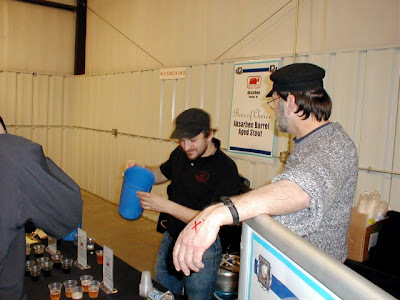 Paris & I kept pretty busy pouring three-ounce samples of All-American Gold, Princess of Darkness Porter, Fire in the Hole! Rauchbier, and Bugeater Brown Ale, but I did get to take a quick break to take pictures of all the brewery booths. Travis says "Hopluia!" at the Spilker booth. A good time was had by all, and then at 9:30 it was over. From the weight of the kegs, it looks like the Princess of Darkness Porter and the Fire In The Hole! 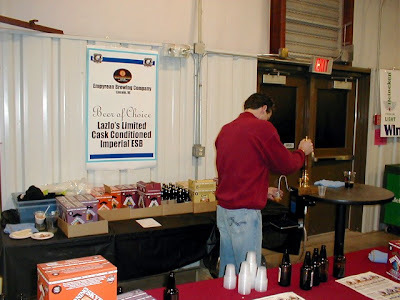 Rauchbier were our most popular beers, or at least we poured more of them than the other two. (Lots of people tried the Rauchbier, but about half of them poured it out. You either like smoked beers or you don't.) We loaded everything back into the car and got home around 11:30. I'll take the kegs back to the brewery on Monday. I need to figure out a better way to pour small quantities of beer from small kegs. The picnic pumps are handy, but they tend to leak a lot, and they're so low to the floor that pumping them all night was back-breaking work. I have a cooler with a cold plate and four taps, but it's a real pain to haul around and set up. Upstream had some nifty standalone taps that use tiny CO2 bulbs; I think I'll look into getting a few of them. Today's project: brew seven barrels (217 gallons) of our second-best-selling beer, All-American Gold. 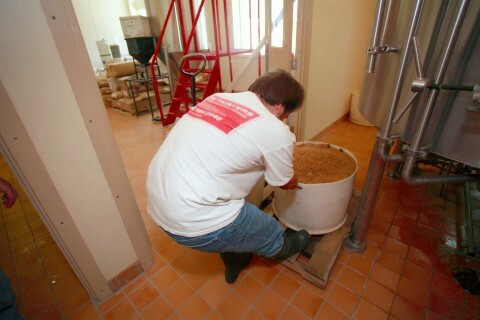 It's a pretty light beer, with only 350 pounds of malt. The target Original Extract is 9.1° Plato (specific gravity 1.036), with an estimated bitterness of 12 IBU and color of about 1.4° Lovibond. I put the malt in the grist case yesterday, and the water's hot, so I started mashing in right away at 9:21. It took about ten minutes to get the grist and the water into the mash tun, and thanks to the well-modified Briess malt that I use, I was able to start the vorlauf at 9:36. The runoff was cloudier than I like, but it tasted great, and the first runnings measured 18.6°P. Sparging ended around 11:00, and the kettle was full by 11:37. Last runnings measured 2.0°P, and the kettle extract was 11.0°P, quite a bit higher than my target of 8.4°P. Nice efficiency there. The wort started boiling at 12:15. In go the hops, about two pounds of Saazer. 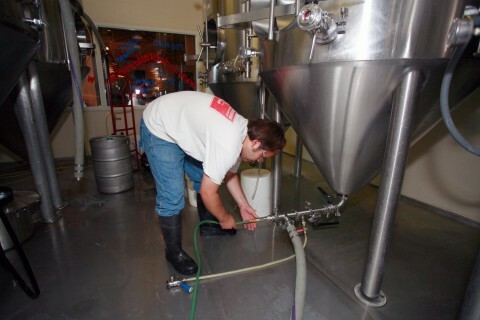 During the boil, I have time to hook up the fermenter hoses and pull the spent grain out of the mash tun. The Whirlfloc B®, an Irish-moss-like kettle coagulant, went into the kettle at 13:05, and the boil ended ten minutes later. The Original Extract is 11.2°P, much higher than my target, but that means I only got 1.8% evaporation. (Eight to ten percent per hour is what you should expect, but this system refuses to go that high.) The whirlpool pump runs for three minutes, then the wort settles for twenty. Usually I can nip downstairs to the pub to get a beer and a bite to eat, but today I have to use the time to finish cleaning the mash tun, since I've been busy typing these notes. 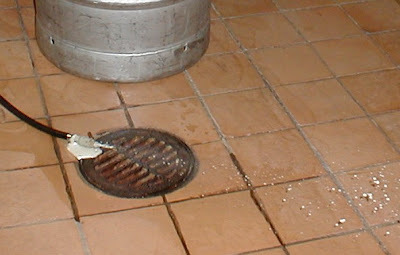 It's 15:00; the brewhouse vessels are clean, the heat exchanger is cleaned, rinsed, and sanitized, and the only thing left to do up here is mop the floor. More goodies on my desk! Boxes and boxes of Tri-Clamp gaskets. I'm going to replace all 299 of them on all three floors in an effort to clean things up around here. I got an order for a keg of All-American Gold, and he wants to pick it up tomorrow. Normally, that's Very Short Notice, but since I have to fill some kegs for tomorrow's beer festival in Lincoln, I told him I can fill his too. But I think I'll take a beer break first. OK, that's better. It's amazing what a pint of Hefeweizen and a cup of clam chowder can do. It's ten minutes to four, and I have to fill a half-barrel of Gold, plus a sixth-barrel each of Gold, Princess of Darkness Porter, Fire in the Hole! Rauchbier, and Bugeater Brown Ale. 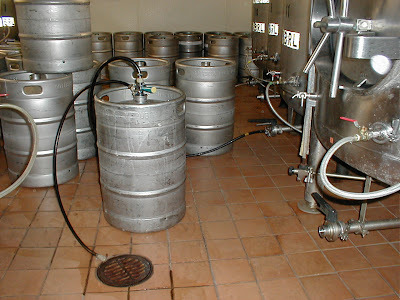 I don't have my camera today, so I'll post pictures of the keg-filling process when I fill the regular weekly orders next Thursday or Friday. 16:15. The kegs are filled, the boots are off, and I've got about five minutes' worth of recordkeeping to do. Then I'll have one more beer and walk home. 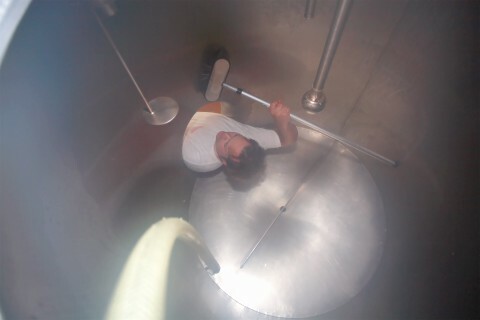 So there you go; a rare day in the life of a brewer where everything went pretty much according to plan. Next time I brew, I won't go into nearly so much detail. Ditto for every new job (filtering, kegging, etc): I'll include all the gory details only the first time I write about it. And now it's time for a beer at home. Tomorrow afternoon, I'll come back, load up the car, and drive down to the festival in Lincoln. We go through a lot of root beer here at Gottberg. Not only do we sell pints and growlers galore over the bar, but several wholesalers in Nebraska and one in Iowa take kegs out of here by the pallet. So today's big task was to make 28 barrels (868 gallons) of root beer. We also sell a Red Cream Soda that's not nearly as popular as the root beer, but it does have a loyal following. We alternate batches of Red and Orange Cream Soda, and since the Red tank was nearly empty, I kegged it off and made 7 barrels (217 gallons) of the Orange. Soda is really easy to make. (Actually, it's pretty boring compared to brewing beer, but it pays the bills.) So much hot water, so much flavor extract, a dash of citric acid for bite and a dash of sodium benzoate to help keep it fresh. And then there's the sugar. 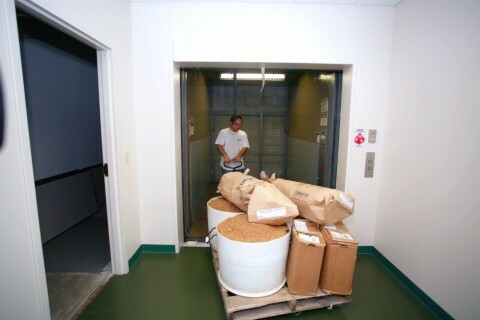 The sugar comes in 100-pound sacks that I carry up the six-stair platform to the kettle and dump them in. Two hundred and fifty pounds of sugar per seven barrels. That's 2.3 ounces of sugar per pint. That's 260 calories per glass, nearly twice what's in the beer. But like I said, it pays the bills. Once it's all mixed up and the sugar has dissolved, I run the soda through the heat exchanger to the dedicated soda tanks in the cellar and force-carbonate it. After a day or two, it's fizzy enough to keg or to serve right out of the tank. 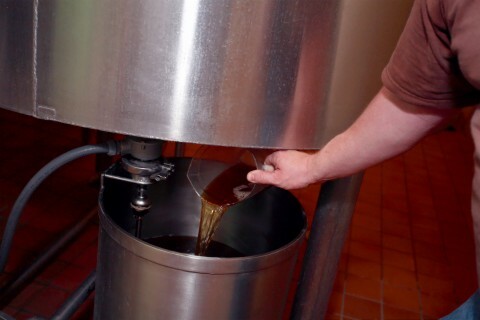 Seven barrels of root beer lasts us about a week; the same amount of cream soda lasts a couple of months. A shipment of yeast arrived today, so tomorrow I'm planning to brew seven barrels of our All-American Gold, our second-best-selling beer. Since I've got time to kill while the heat exchanger cleaning cycle runs, I can get the grain ready for the brew. Three hundred fifty pounds (seven 50-pound sacks) of malt get carried up the five-stair platform and dumped into the grist case. There it sits until tomorrow morning. I also got tomorrow's fermenter and hoses cleaned and sanitized to save a bit of time. Also newly-arrived on my desk are a boxful of parts to rebuild all of my keg couplers, which are in desperate need of cleaning and maintenance, and a seal kit for my beer filter, which has been leaking beer and DE and generally making a mess. Those two projects will happen early next week. Had a couple of beers at the bar, then it was time to go home. Read the entire article here. View The History Channel's video on the subject here. Here's a new feature that I hope you find interesting. 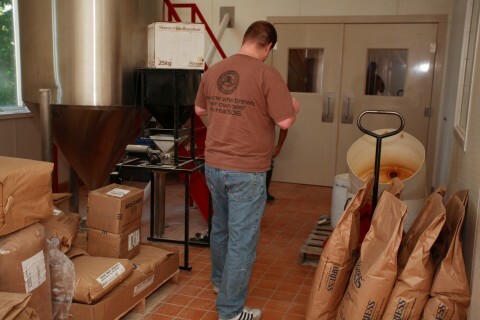 A Brewer's Life will contain a more-or-less daily account of what goes on here at Gottberg Brew Pub. I'll include pictures when I can, but since I mostly work alone, I won't be in many of the pictures myself. (Some may consider this a Good Thing.) If you've ever thought you'd like to make beer for a living, A Brewer's Life will give you an idea of what you have to look forward to. 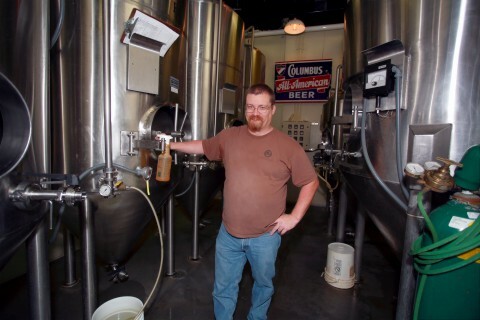 Some background: I started brewing at home in 1990, and after four years I decided that making beer for a living would be a lot more fun than continuing my computer technical support career. I moved to Hawaii in 1995 to join a brewpub startup on the island of Molokai, but that was a total bust that cost me all of my retirement money. I returned to civilization in 1998 and attended the Professional Brewer Certification Program at the Siebel Institute of Technology in Chicago. 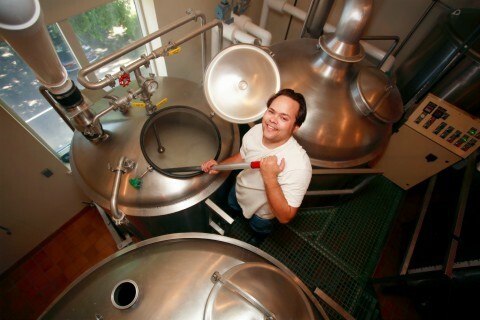 They helped me land my first brewing job at Egan Brewing, a small brewpub in De Pere, Wisconsin. I was there right up until they closed in September 2001 due to the owner's illness. 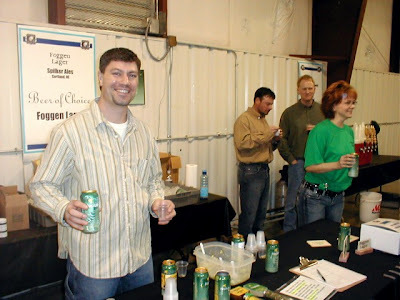 Subsequently, I brewed in Bonduel (6 months part-time), Oshkosh (14 weeks), Green Bay (4 week temporary gig), and Clear Lake (12 months), all in Wisconsin. In May 2005, I heard about a job opening in Columbus, Nebraska, just an hour from my hometown. They hired me right away, and I've been here at Gottberg ever since. As in all my previous jobs, I'm responsible for Everything Beer, from ordering the ingredients and creating the recipes to cleaning the taps and everything in between. 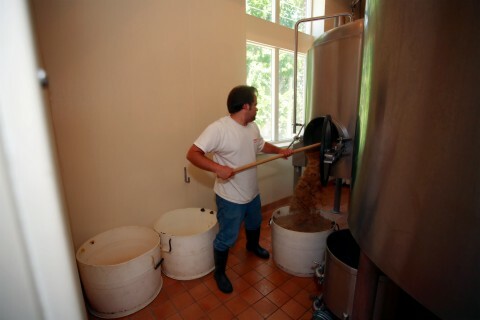 So I hope A Brewer's Life will show you what it's like to brew for a living. But even if you don't find it entertaining — or even useful — at least it will give me a record of what I've been up to and get me to stop procrastinating so much. Good news: I've migrated this blog to the new BlogSpot system. It will make maintenance of the site much easier in the future. Bad news: A side effect of the migration is that eleven months worth of entries got reposted, and they're showing up in the syndicators as if they're brand-new. Sorry about that, but at least with this new system it won't happen again. AMSTERDAM, Netherlands (AP) -- After a long day hunting, there's nothing like wrapping your paw around a cold bottle of beer. So Terrie Berenden, a pet shop owner in the southern Dutch town of Zelhem, created a beer for her Weimaraners made from beef extract and malt. Thanks to Thomas and all of the Beer Me! contributors for contributing to the site's success! 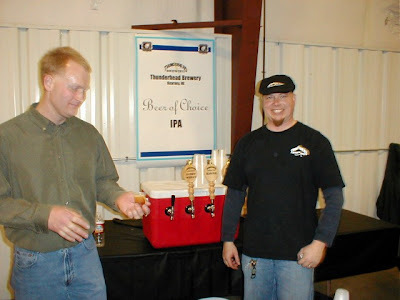 This summer, I got a call from a guy in the next town up the road (Norfolk, Nebraska, about 45 miles north) who said he had been applying to brewing schools, and they told him he should do a three-month internship in an actual brewery to get the most out of the courses. I told him sure, I'd be happy to put him to work for a few months. In fact, I worked him so hard that I used to introduce him as "my rented mule". There are about 28 students. Half of them are turks, all from Efes, 1/3 are tai and the rest are quite a crew. I'm making some good friends and learning to live without hops. There is lots of memorization, but an evening beer or two helps. Send me an IPA!! I'm pretty swamped but thought i would get off a quick note. So if you know where Jeremy can find a big, hoppy, bitter beer in Berlin, please let me know and I'll pass the information along. Otherwise I just might have to bottle up some of my own and hand-deliver it. Europeans Rushing To Bulgaria To Buy "Breast-Boosting Beer"
Sofia, Bulgaria (AHN) -- European men are rushing to Bulgaria to buy Boza beer, which is said to boost women's breasts, after Bulgaria's accession to the EU abolished prohibitive customs duties on the drink. Look here for Wikipedia's definition of boza, which appears to be a sort of beer style, rather than a brand name. Here is a recipe for a five-liter batch of homebrewed boza. When I give tours of the brewery, one of the most common questions I hear is "where do you put the alcohol in?" This article by Andy Coghlan of The New Scientist answers that question, along with a quick lesson in microbiology. Next time you raise a glass of something alcoholic to your lips, spare a thought for the humble organism that makes it all possible. From the crudest home brew to the most exquisite champagne, the production of almost all alcoholic drinks depends on the single-celled fungus we call brewer's yeast. Some time in the distant past Saccharomyces cerevisiae, to give it its full name, developed a chemical trick that would transform human societies. Some anthropologists have argued that the desire for alcohol was what persuaded our ancestors to become farmers and so led to the birth of civilisation. Whether that's true of not, alcohol has had a huge influence on our history and our prehistory. 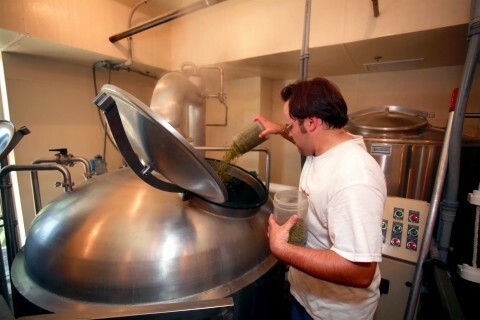 Happy anniversary to me: it was seventeen years ago today that I brewed my first five-gallon batch of Pale Ale in my tiny apartment kitchen in San Leandro, California. I think I still have the recipe somewhere; I'll post it if I can dig it up. The extract kit was a Christmas gift from my mother. 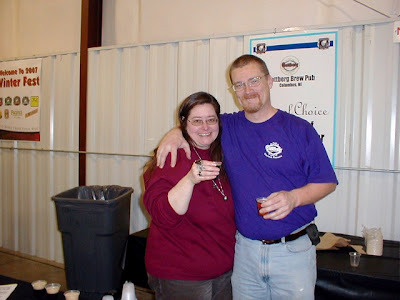 I told her later that she had created a monster, because that was the first step toward giving up my software career in favor of becoming a full-time brewer. So here's to you, Mom, on the 17th anniversary of that fateful brew. Thanks! [Edit 01-12-2007: Paris found my old recipe book; here's the scanned image of "Batch #1". 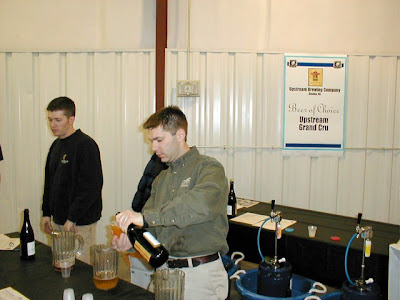 Note also that the seventeenth anniversary of the brew was not yesterday at all, but rather next Friday, January 19. I figure that gives me an excuse to throw another party next week!